Democratic members have increasingly expressed support for a physical barrier on the U.S.-Mexico border over the course of immigration negotiations, making it harder for party leaders to ignore their positions. Prior to the lengthy partial government shutdown, Senate Minority Leader Chuck Schumer seemed to have complete control over the members of his party, even those who had expressed support for the wall during election campaigns. House Speaker Nancy Pelosi — then the House minority leader — promised that she would not appropriate a single dollar to the wall, despite Trump’s promise of a shutdown if he did not receive $5.7 billion to build on the border. But a number of rank and file Democrats have since said that they support a physical barrier in concert with other border security measures, perhaps due to pressure from the extended shutdown and a desire to prevent another one. Freshman California Rep. Katie Hill, Washington Rep. Adam Smith, and Illinois Rep. Cheri Bustos have all conceded that fencing in certain areas is something that they are not reflexively opposed to. 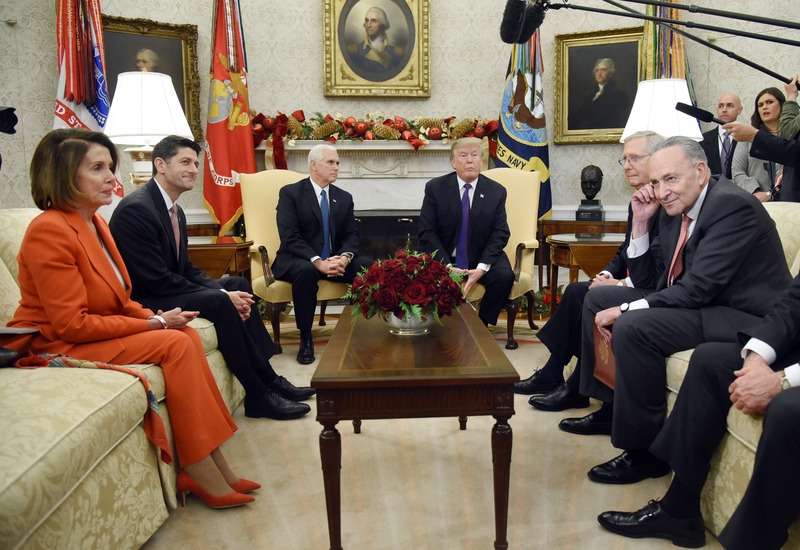 Virginia Rep. Elaine Luria, along with 30 other members, urged Speaker Pelosi to make a deal with Trump in a letter last week and offered perhaps the most accurate view of Trump’s border proposal by Democrats yet. But even high-ranking Pelosi loyalists are now publicly signaling that they might be open to a deal with the president. Virginia Sen. Mark Warner claimed during an NPR radio interview Tuesday morning that the White House is not negotiating in “good faith” over border security. When pressed on why Democrats haven’t moved from their initial negotiating position, Warner claimed he supported physical barriers all along. “No, listen, I’ve said repeatedly that increased border security, even if some of that means a barrier, but it ought to be based upon the experts who know how to spend funds at the border — not some arbitrary number picked by the president,” Warner said. Unfortunately for the president, many of those congresspeople have signaled a deep unwillingness to fund anything resembling a wall. However, the increased public support for a wall from other members in their party may put pressure on the committee to be open-minded and eventually reach a deal that is favorable to both sides. Pelosi acknowledged that Trump reopened the government by extending an invitation for him to deliver a State of the Union address next Tuesday, but she has not indicated publicly whether or not she will now negotiate on the wall. Members of her party are speaking for her during her apparent silence — and many of them are open to a wall.